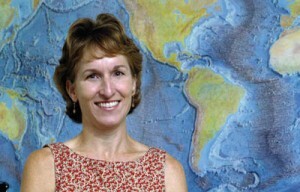 Susan Lozier received her Ph.D. in 1989 from the University of Washington; the ﬁ rst woman to grad-uate from the physical oceanography program. Following postdoctoral studies at WHOI, she joined the faculty of Duke University in 1991, where she is now a full professor and holds the Truman and Nellie Semans chair in Earth and Ocean Sciences. Susan received an Early Career Award from NSF in 1996. She teaches undergraduate and graduate courses at Duke and is currently the Director of Undergraduate Studies for her department and an adjunct scientist at WHOI. Th ough her work has primarily focused on data analyses and modeling, now that her children are older she is enjoying heading out to sea once again. When I was a graduate student studying chemical engineering at the University of Washington, a professor of an applied mathematics course repeatedly used examples from geophysical fluid dynamics to illustrate applications for differential equations. I never looked back. I was hooked from the start on the material, but now, through the years, it is a community of scholars, colleagues, students, and friends that has me hooked. Though I take pride in my individual research, I am keenly aware that the support of the physical oceanographic community has been invaluable to my work. In particular, I was fortunate to have had great mentors at UW, as a postdoc at Woods Hole Oceanographic Institution, and as a new faculty member at Duke. In appreciation of such support, I recently initiated an effort to promote community-wide mentoring of junior women in physical oceanography: our community is strengthened by our commitment to one another. In physical oceanography, my research interests center on the structure and pattern of an ocean basin’s flow and property fields, with a specific interest in how active and passive tracers are distributed from source regions. The application of my work has focused on the North Atlantic basin; a current field program focuses on Labrador Sea Water pathways, while a recently funded modeling project focuses on the climatic variability of the Mediterranean overflow waters. My work is greatly enhanced by my role as an educator. Teaching is no longer something I do: it is something I relish. I could not be more serious about my role as an educator or more grateful for the opportunities and satisfaction it brings. My professional path has been decidedly shaped by my personal life. Though I am a researcher and an educator, I am also a wife and a mother of two teenage boys. I left Seattle in 1989 with a new degree and a new baby to head to WHOI for a post-doc and then, two years later, I left WHOI for a faculty position at Duke with another baby in tow. I‘ve spent the last sixteen years balancing the needs of my family and the demands of my work. Long ago I realized that dedication to my career was not going to be measured by the number of hours that I spent at work. Rather, I have chosen to express my dedication by approaching my work with a commitment to my science, my colleagues, and my students.